Our ride to Mt Nebo was a big one. 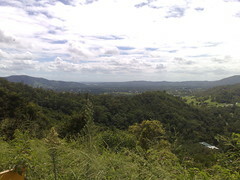 We thought the climb up the mountain would be difficult, but it wasn’t. 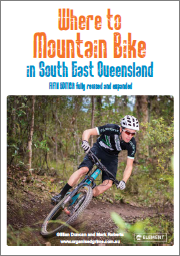 We thought the ride back down via Bellbird Grove and Camp Mountain would be easy, but it wasn’t. All up we travelled about 55km. I burned over 4,200 calories and drank copious quantities of sports drinks, and had a large “lunch” at about 10am at the Mt Nebo cafe. 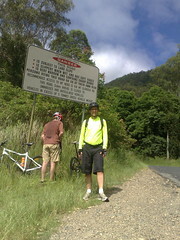 Our total ascent for the ride was 1,437 metres (about 4,500 feet). I just want to say how much I admire my mate Simon. This was the hardest ride he’s ever done, and he just kept going – even when he was hurting and didn’t really want to go on at one stage. 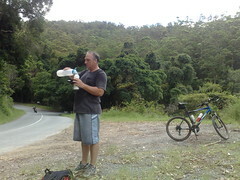 Even when we should have given him a break and taken a quicker route back to Samford from Camp Mountain. Simon – you’re amazing, mate. This ride brought home to me the important lesson that we do this because it’s fun. We don’t do it to set world records, or to be heroes, or to win races. And when riding in a team everyone in the team needs to look out for each other. So that’s going to be my #2 rule in future, after riding safely. 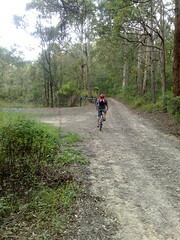 The Goat Track is a dirt road “short cut” from Samford to Mt Nebo. It’s one way – you’re only allowed to go UP the road, not down it. It’s pretty steep – but we overestimed the grade, and got up quite easily. 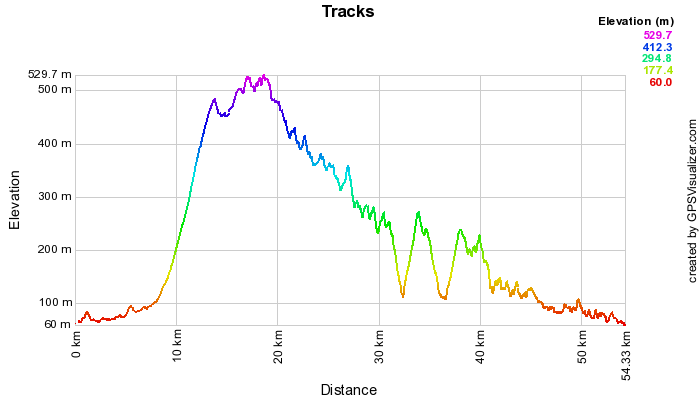 The total climb up the track is just under 440m in about 5km. South Boundary Road was pretty difficult. 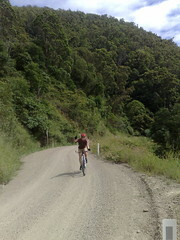 The descents were rocky and the final ascent before rejoining the bitumen road is a killer. I had to walk part of the way because it was too steep. 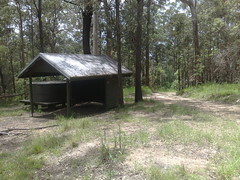 Bellbird Grove was deserted – which was unusual for a Saturday lunch time. There’s no drinkable water there, but lots of picnic tables, BBQ’s and shade. 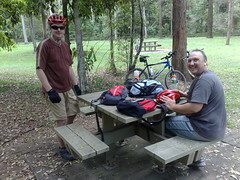 We rested here before trying to attack the fire road up Camp Mountain, which leans down into the Samford Valley. 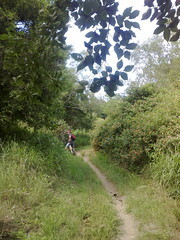 One of the many pony trails in the Samford Valley. 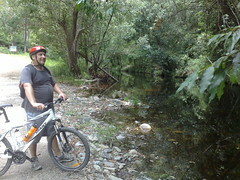 One way to avoid the cars, but at the end of a 55km ride, the trails were hard work!